Send me my FREE Ring Sizer! Not sure of your ring size? No problem, use the contact form below to send us your name and address and we will send you a Free Ring Sizer. The Ring Sizer works like a belt. Simply push the end through the buckle to form a ring shape. 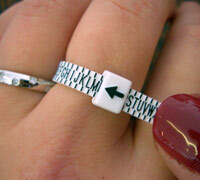 Slip the Ring Sizer onto your finger. Adjust to give a comfortable fit. Make sure that it just slips back over the knuckle. When you have found the best fit for you read off the size indicated by the arrow. In the picture above it is size M.